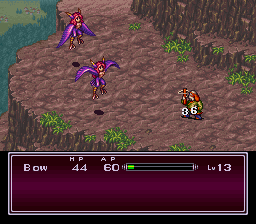 The sequal to Capcom's RPG wonderful series. 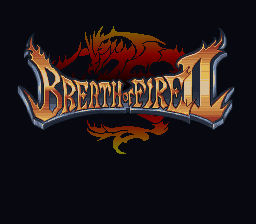 Breath of Fire 2 v0.8 by E.G.T.K. When used with Nintendo Power Memory carts, this game takes up 5 blocks for the game and 4 for the save file. The Nintendo Power cost is 1000 yen. 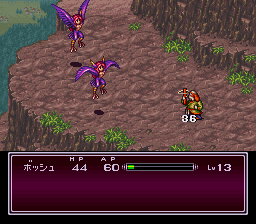 The US version reports itself as being 24 Mb while the Japanese version is 20 Mb. 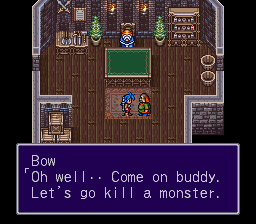 Breath of Fire was one of the better and more successful RPG's on the SFC, so of course there was always going to be a sequel. This time Capcom have really pulled out all the stops and improved on the original in EVERY way!!!. The game is absolutely HUGE and may even be the largest RPG on the machine?!. The plot line is involving and has you gripped from the very first scene. The characters and the way your group grows is superb (later copied by Square for FFVII on PSX). Also gone now is the linear nature of the first game, and relies much more on exploration! But it's the fighting that is now so much better! 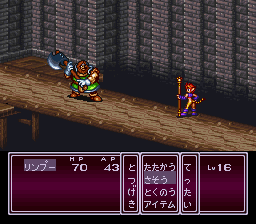 Complex battle scenes mean you need to know your characters and their magic inside out, plus the enemies fight different every time, meaning there is never any one sure way of defeating them! 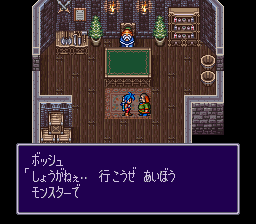 Top all this off with Capcoms usual expensive, lush graphics, sound and presentation, and you have the BEST turn based RPG on the SFC! !